I love Martha Stewart. She’s basically a cooking and organizational goddess in my book. But recently, she kinda failed me. 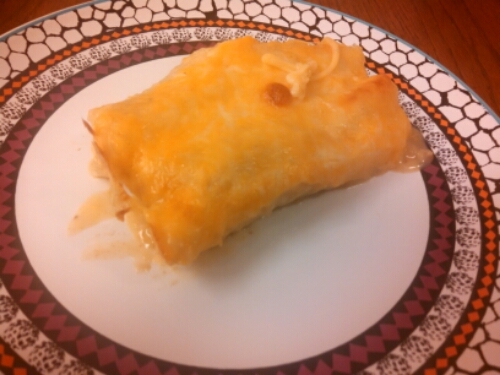 A few weeks ago, I made these lighter chicken enchiladas by good ol’ MS, and later referenced to it on Facebook. 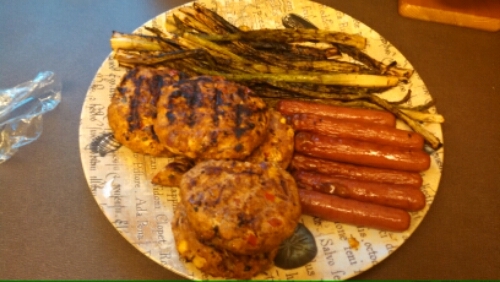 To be clear, the recipe and dish itself was not a failure – the final product was quite good – and you’d truly never know that it’s “light.” BUT, her instruction on how to cook the chicken failed miserably and ended up taking forever to make this dish. She said to basically steam the chicken, and I had never done that before, so I followed her instruction to a tee, and ended up with not even half-done chicken. Like…the ENTIRE center was still raw and pink. 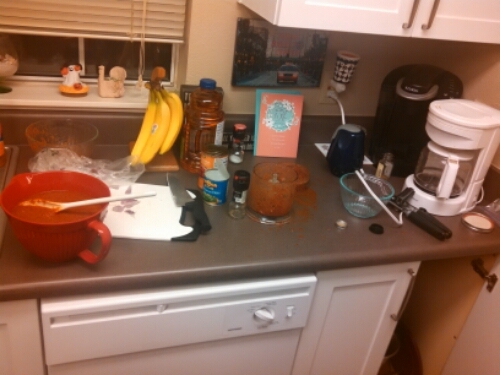 Therefore, I had to kick up the oven and bake for about 30 more minutes until it was done. It really irritated me for several reasons. One, baking chicken is not unhealthy, so it would have been just as easy to do that in the first place. Two, it wasted a lot of time. I spent 20 minutes on the steaming method, then had to spend an additional 30+ minutes actually cooking the chicken, when it didn’t work. It would have been so much easier, and less time consuming, to just bake it to begin with. In any case, I digress. As long as you don’t steam your chicken (or maybe you have a tried-and-true steaming method – if so, please share!! ), you will be fine, because like I said, the final product was truly quite delightful! Also, I omitted the chiles, because I didn’t want to buy a whole can just to use a small amount (hate that), plus my husband doesn’t like peppers. Side note: I apologize for the terrible pictures. 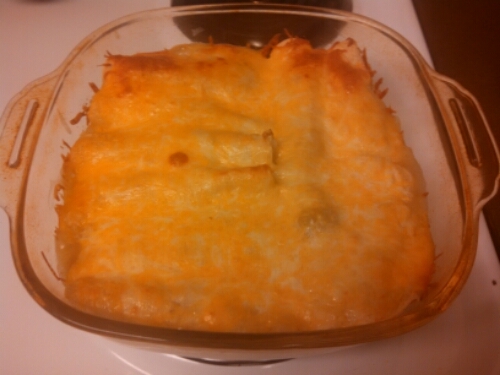 It’s kind of difficult to take a flattering photo of enchiladas! -To cook the chicken, preheat oven to 400 degrees. Cook chicken for about 30-40mins, or until done (I like to cut my chicken into smaller pieces about halfway through, to cook better, and makes it easier to shred/cut later). I lightly seasoned mine with salt and pepper. -While chicken is cooking, make the sauce: In a medium saucepan, heat oil over medium. Add garlic and cook until fragrant, 1 minute. Then add flour, cumin, and chipotles in adobo and cook, while whisking, for about 1 minute. Then whisk in the broth and 1/2 cup water and bring to a boil. Once boiling, reduce it to a simmer, and cook, whisking occasionally, until the sauce has thickened slightly, about 5 to 8 minutes. Season with salt and pepper. -Once the chicken is done, shred it with your hands or with forks, and toss it with 1/2 to 1 cup of the finished sauce, making sure to fully coat all of the chicken. 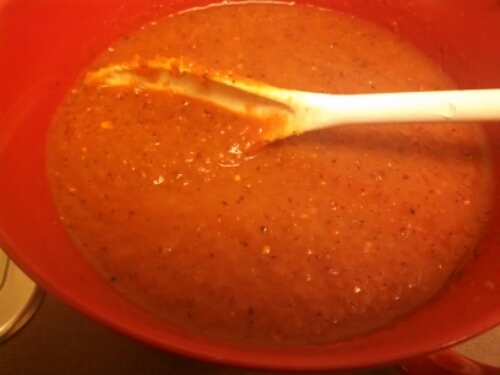 -Pour 1/4 cup sauce into bottom of an 8-inch square baking dish and set aside. 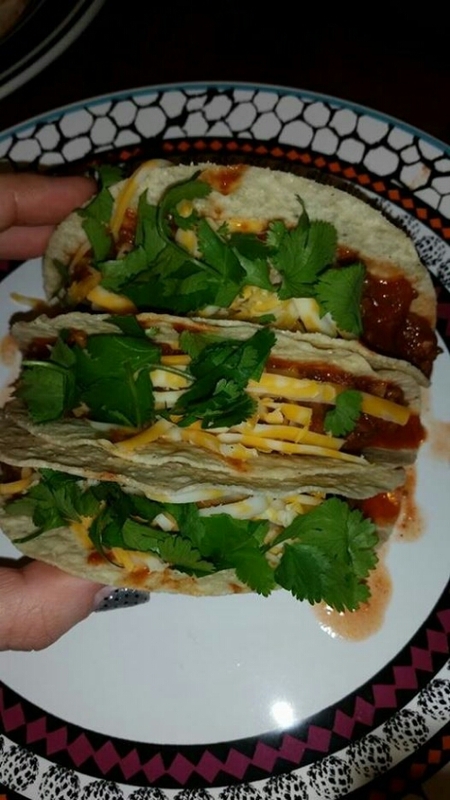 Stack tortillas, and wrap in a double layer of damp paper towels; microwave until hot, about 1 minute (this helps make them pliable – you can also follow package instructions or your own method for making corn tortillas pliable). 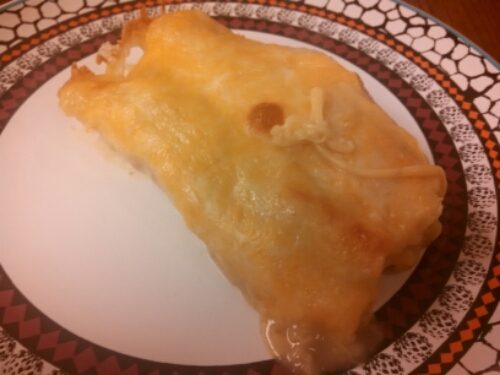 Fill each tortilla with chicken mixture, roll up tightly, and set it, seam-side down, in the baking dish. Do this for each tortilla, then cover with the remaining sauce, and top with cheese. 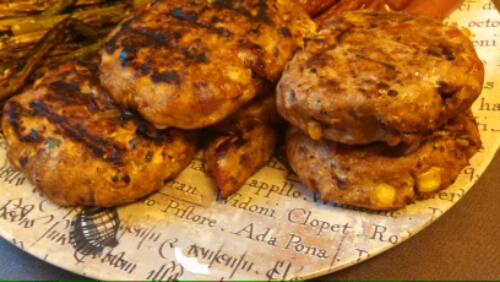 -Bake until hot and bubbling, about 15 to 20 minutes. Let it cool 5 minutes before serving. 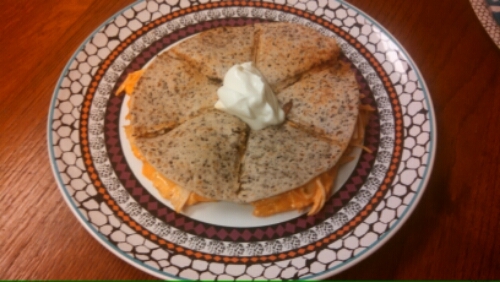 Two posts in a row of buffalo chicken recipes! Anything buffalo chicken-esque is pretty amazing in my book (check out my buffalo chicken soup from the other day, along with my buffalo chicken pizza, my other buffalo chicken pizza, and my buffalo chicken enchiladas). But, in true Whitney-form, I rarely make the actual, traditional dish (aka buffalo chicken wings)…instead I make fusion dishes. However, if anyone does have a tasty buffalo wing recipe, let me know, cuz I’m willing to give it a whirl! In any case, this was a pretty simple dish. It has minimal ingredients and minimal directions. It is even quicker if you already have cooked chicken on hand (you can use my friend Alysha‘s crockpot chicken method, or bake at 375ish for 30ish minutes…or you could chop it up ahead of time and pan-fry it pretty quickly). This is truly a “dinner on the table in a few minutes” recipe. 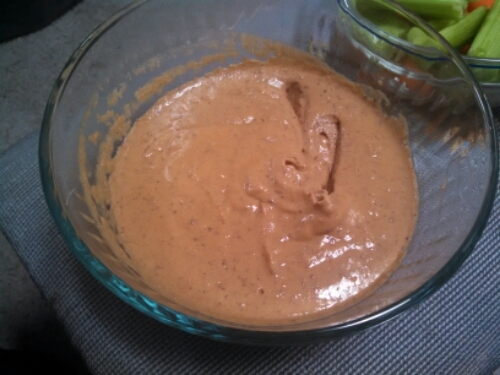 -Mix together chicken, hot sauce, and dressing until well combined. -Spray skillet with olive oil or non-stick cooking spray and place a tortilla shell in the skillet. 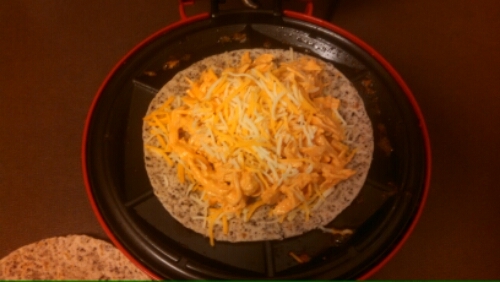 Spread cheese, chicken, veggie mix, and top with another tortilla. 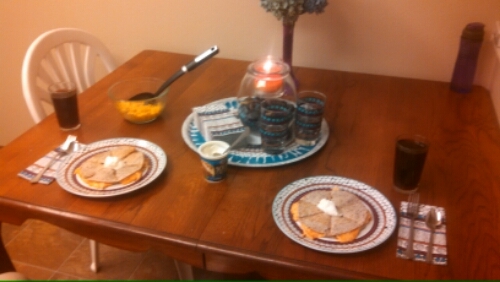 -Cook over medium heat for 3-5 minutes per side or until tortilla turns light golden brown and cheese is melted. -Repeat with remaining tortillas and filling. (If you have a quesadilla maker, like me, just spread some oil over each side of the maker, and follow the same layering instructions, then close the lid, usually the makers will tell you when it’s done, or you can periodically check). 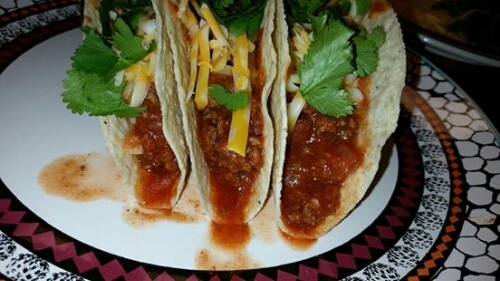 -Cut into wedges and serve with sour cream and salsa.